With so many diverse groups and unique islands spread all over the Equator, there are plenty of interesting facts about Indonesia; some may surprise you. Indonesia is the largest nation in Southeast Asia (by size) and the fourth most populous country on earth. It's a geological wonderland. Take the Equator, add hundreds of volcanoes at the meeting point of the Indian and Pacific Oceans, and well, you end up with one very interesting and exotic destination. Although Bali, a top honeymoon spot in Asia, gets plenty of attention, most people don't know much about the rest of Indonesia. If you've got the patience to dig deeper, Indonesia has the rewards. Indonesia is the fourth most populous country in the world (261.1 million people per a 2016 estimate). Indonesia is surpassed in population only by China, India, and the United States — in that order. Taking outbound migration into account (a lot of Indonesians find work abroad), population growth in Indonesia for 2012 was around 1.04 percent. Between 1971 and 2010, Indonesia's population literally doubled in 40 years. In 2016, the median age in Indonesia was estimated to be 28.6 years old. In the United States, the median age was 37.8 in 2015. Indonesia is the world's most populous Islamic nation; a majority are Sunnis. But religion can vary from island to island, especially the farther east from Jakarta one travels. Many islands and villages in Indonesia were visited by missionaries and converted to Christianity. Dutch colonists spread beliefs. Old superstitions and animist beliefs pertaining to the spirit world weren't totally abandoned. Instead, they were blended with Christianity on some islands. People can be seen wearing crosses along with talismans and other charms. 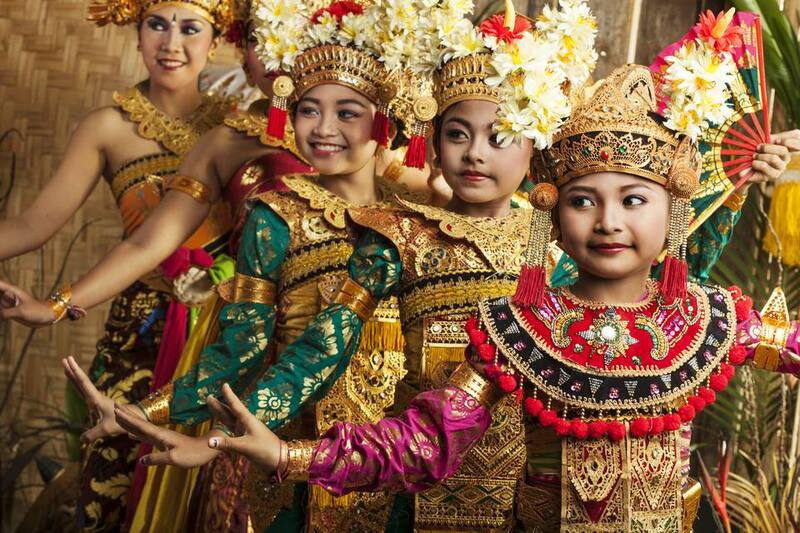 Bali, an exception in many ways for Indonesia, is predominantly Hindu. Indonesia is the largest island nation in the world. With 735,358 square miles of land, it is the 14th largest country in the world by available land. When both land and sea are taken into account, it is the seventh largest in the world. Indonesia is spread across an archipelago of many thousands of islands, however, no one can really agree on just how many there are. Some islands appear only at low tide, and different surveying techniques yield different counts. The Indonesian government claims 17,504 islands, but a three-year survey conducted by Indonesia only found 13,466 islands. The CIA thinks Indonesia has 17,508 islands — that's down from the estimated 18,307 islands counted by the National Institute of Aeronautics and Space back in 2002. Of the estimated 8,844 islands that got named, only around 922 are thought to be permanently settled. The segregation and island isolation made culture less homogeneous across the country. As a traveler, you can change islands and be treated to a relatively new experience on each with different dialects, customs, and special foods. Despite the abundance of islands, tourists tend to cram onto just one and fight for space: Bali. The most famous tourist island is the usual entry point for travelers who want to visit Indonesia. Cheap flights can be found from major hubs in Asia and Australia. Bali is roughly in the center of the archipelago, making it convenient as a jump-off point for exploring farther afield. Other airports may be better options if you intend to visit distant or remote places. It can be hard to believe while standing in modern, metropolitan Jakarta that uncontacted tribes are assumed to still exist in the jungles of Sumatra just a short distance to the west. An estimated 44 of the world's more than 100 uncontacted tribes are thought to be living in Papua and West Papua, provinces in the very east of Indonesia. Although far more behaved in modern times, there are still living headhunters in Indonesia. The practice died out decades ago, but some indigenous families have even kept their grandfather's "trophies" stored in closets in modern-day homes. Headhunting and ritual cannibalism were practices on Pulau Samosir in Sumatra and in Kalimantan, the Indonesian side of Borneo. Indonesia has around 127 active volcanoes, a few of which have been erupting since written history. With Indonesia being so populous, it is inevitable that millions of people are living within eruption zones at any given time. Gunung Agung on the busy island of Bali spooked a lot of tourists when it erupted in 2017 and 2018. The 1883 eruption of Krakatoa between Java and Sumatra produced one of the loudest sounds in history. It ruptured the eardrums of people over 40 miles away. Airwaves from the blast circled the globe seven times and were recorded on barographs five days later. Tidal waves from the cataclysmic event were measured as far away as the English Channel. The world's largest volcanic lake, Lake Toba, is located in North Sumatra. The explosive eruption that formed the lake is thought to have been a catastrophic event that resulted in 1,000 years of cooler temperatures on earth due to the amount of debris thrown into the atmosphere. A new island pushed up by volcanic activity, Pulau Samosir, has formed in the center of Lake Toba and is home to the Batak people. Indonesia is the only place in the world to see Komodo dragons in the wild. The two most popular islands for seeing Komodo dragons are Rinca Island and Komodo Island. Both islands are in a national park and part of East Nusa Tenggara province between Flores and Sumbawa. Despite their ferocity, Komodo dragons are listed as threatened on the IUCN Red List. For decades, their highly bacterial saliva was assumed to be responsible for making Komodo dragon bites so dangerous. Only in 2009 did researchers find what could be venom glands. Komodo dragons occasionally do attack park rangers and locals who share the islands. In 2017, a Singaporean tourist was attacked and survived a dangerous bite to the leg. Ironically, the many cobras that live on the islands are considered to be far more dangerous by the locals who live there. Sumatra and Borneo are the only places in the world to see wild orangutans. Sumatra belongs entirely to Indonesia, and Borneo is shared between Indonesia, Malaysia, and Brunei. An easy place for travelers in Indonesia to possibly see Sumatran orangutans (semi-wild and wild) living in the jungle is Gunung Leuser National Park near the village of Bukit Lawang. Although Bahasa Indonesia is the official language, more than 700 languages and dialects are spoken across the Indonesian archipelago. Papua, just one province, has over 270 spoken dialects. With over 84 million speakers, Javanese is the second most prominent language in Indonesia. The Dutch left behind some words for items that weren't present before their colonization. Handuk (towel) and askbak (ashtray) are two examples.